The Washington Spirit earned their second-straight scoreless draw as neither side was able to find a goal. 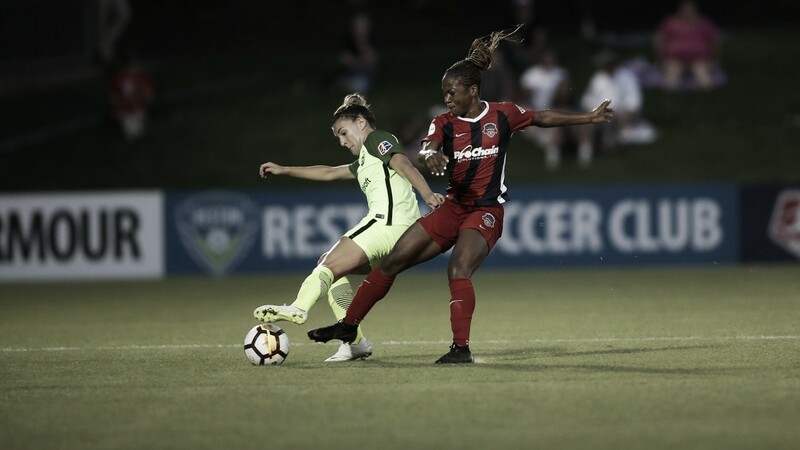 The Washington Spirit drew Seattle Reign FC in their second-straight scoreless draw, but their second-straight game with a result. The Spirit are still winless in their last four matches sitting in eighth place with 10 points and a 2-7-4 record. Seattle’s point has them tied with the Orlando Pride for second with 19 points and a 5-2-4 record. Statistic-wise, the Reign dominated the game offensively. Both squads recorded 17 shots, but Seattle put six of them on goal to the Spirit’s two on goal. Seattle led corners 7-2 and crosses 23-11 as well as possession, having the ball 57.8% compared to Washington’s 42.2%. Reign goalkeeper Lydia Williams wasn’t called to action much but earned her fourth-straight shutout with two saves. Both sides played a physical match. They were called for 12 fouls each and earned two yellow cards each, all coming in the second half. 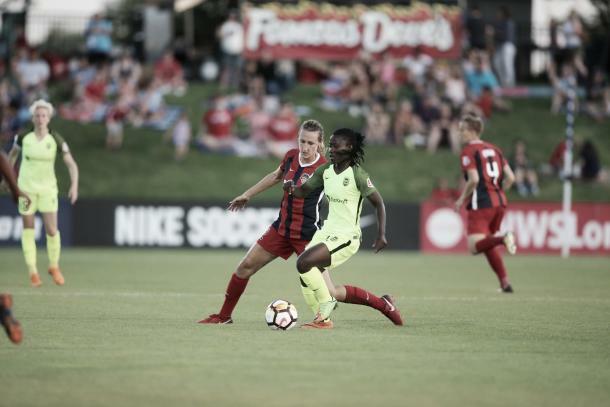 For the Reign, Elizbeth Addo and Jodie Taylor earned cards fouls and Rebecca Quinn and Ashley Hatch earned cards for Washington. The MVP of the match was Aubrey Bledsoe who recorded six saves for league-leading 63 saves this season. She recorded her second-straight shutout and her fourth of the season. Her biggest save came from the spot. Spirit defender Estelle Johnson was called for a foul in the box in the 51st minute. Reign forward Megan Rapinoe stepped up to take the pk but Bledsoe guessed correctly and stopped the low-hit shot to her left to keep the score 0-0. The Spirit had a couple of good chances. The first came in the 26th minute through the run of play. Rose Lavelle dribbled the ball up the middle of the pitch before sending a through ball to Estefania Banini who sent the ball just wide left of goal. Washington had one more chance late in the game. A corner kick found its way to rookie Andi Sullivan, but she was unable to get a clean hit, sending the ball wide right of goal and keeping it scoreless. The Spirit missed Mallory Pugh who continues to be out due to a PCL sprain in her knee she suffered in late May against the Houston Dash. Without Pugh in the line-up the past two matches, the Spirit have failed to score goals for two-straight games. A scary moment in the second half lead to Reign defender Lauren Barnes being subbed out. She was hit in the face with a ball shot from close range by Tori Huster. Barnes remained on the ground but was able to walk off under her own power. Seattle returns home Saturday June 23 to host first-place North Carolina Courage with kickoff scheduled for 1:00 p.m. PT and coverage streaming on go90. Washington will continue their homestand and host Orlando in the game of the week with kickoff at 7:00 p.m. ET and coverage on ESPNNews.